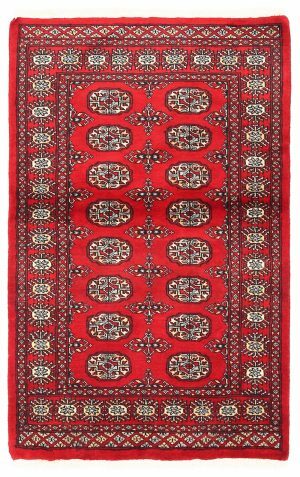 Bokhara rugs are knotted in Pakistan and made of high quality hand spun wool and vegetable dyes. 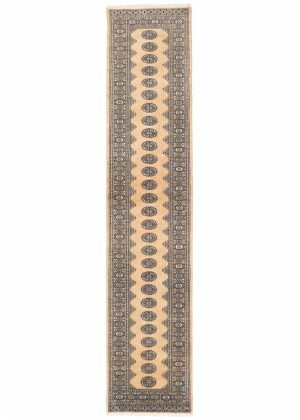 These rugs are known for their repeating rows of guls and geometrical patterns. You can view our gallery of Bokhara rugs and learn more about these rugs below. Pakistani Bokhara rugs have a few distinct characteristics that make them instantly recognizable. These hand knotted rugs have a dense pile, which gives them a wonderfully plush look and feel. This luxuriance is further enhanced by a seemingly endless palette of colors, ranging from rich reds and vibrant greens to deep rusts and classic gold. The hallmark of a genuine Bokhara is the repetitive rows of stylized octagonal flowers called Gul. The traditional Bokhara design is a repetitive pattern consisting of rows of guls and surrounding geometrical patterns. The gul design is basically a stylized octagonal flower. In all Bokhara rugs, the guls are arranged in uniform columns and rows in the field. These motifs are usually slightly oblong and shapely, while still adhering to their basic geometric form. The similarity between the rugs ends there though. Guls come in a wide assortment of forms and can vary in shape, color and design from one rug to another. The background colors and the color combinations also vary hugely, depending on the weaver’s personal interpretation. Add to this the different methods of handknotting that are used in the construction of these rugs and what you have is a completely eclectic array of Bokhara rugs, each one completely different from the other. In fact, despite the design dominance, no two rugs are exactly the same and therein lies the beauty of these dazzling hand knotted rugs. 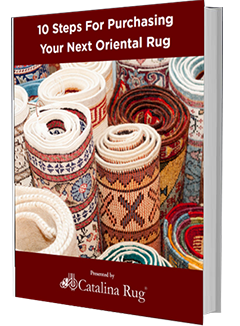 While these rugs come in a wide array of colors, only a few select top colors are used in each individual rug. Although they look strikingly colorful, each Bokhara rug actually features less than six top colors. It is in fact very rare to find a Bokhara rug that has more than six different top colors. Whatever colors are used are traditionally bold hues. Red and rust fields are most common with other popular colors being ivory, teal, orange, black, green, rose, slate, peach and navy. Bokhara rugs are almost always wool pile woven on either a wool or a cotton foundation. New Zealand wool is commonly used in the construction and this gives the rugs a shiny, glossy appearance that looks similar to silk. Rugs made with local Pakistani wool looks more rustic with lesser sheen and luster and a higher pile. 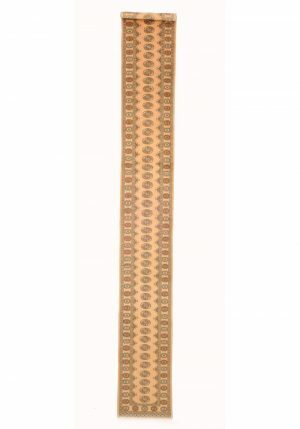 The choice of foundation is usually determined by the region where the rug is being constructed. 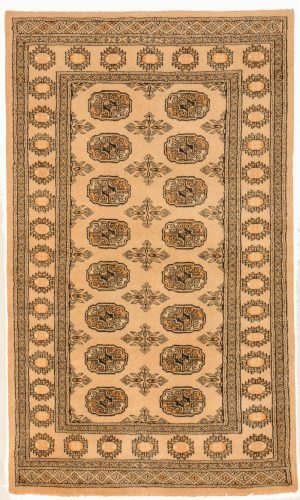 Originally these rugs were made by the Tekke tribe from the Bokhara area in Central Asia. 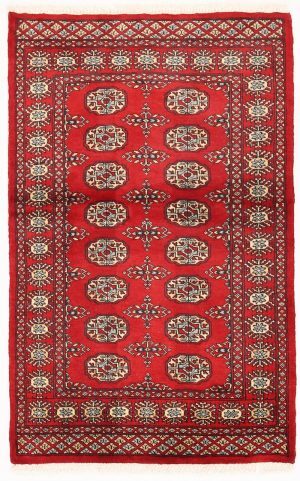 While Bokhara rugs are known for their thick, lush pile, this dense thickness can often detract from the design of the rug in that the outlines of the various design forms are blurry. So when you look for these types of rugs, you will essentially find that there are two qualities. One is the rugs that are left thick for their luxuriant quality and the other is the single pile rugs that are closely clipped so their intricate designs are clearly visible with crisp, clean outlines. The design itself is versatile and can fit in with most interior decor styles.